Here’s some of our best videos from 2006, a good year for beer, an ever better year for monkeyspoon videos. You’ll find the newest vids at the top of the page, and you can leave a comment down the bottom if you wish. Some of the pictures that go with the videos can be found in the 2006 Images page. section of Gores DH, read more about the day here. me following Jeff down Hurst Clough enjoy. We went out a few days later and did a similar thing along Hope Brink and then down Wiseman Hey. Our Christmas themed EPIC RIDE with James, Joe, Josh, Nicky, Alex and Jeff, featuring some of the best downhills in the area and all in one wet winters day. Its five minutes long so may take a while to load, but its worth the wait. You can read about the day here. Irwin and Jeff riding one of the steepest tracks in the area, with some moor riding and nice stills thrown in. James, Boslow and Jeff riding various tracks in and around the Ladybower and Bamford area, this vid is inspired by the 2nd section of the epic MTB film Roam. Irwin’s first ride on his new VP-Free, we pushed up to Win Hill pike for some nice pics, then rode to Hagg Tor for a mess about. James, Nicky, Jack & Co., and Jeff riding up to Crook Hil, down ‘Gores DH’, and then back down the east side of Ladybower, with some epic camera angles. 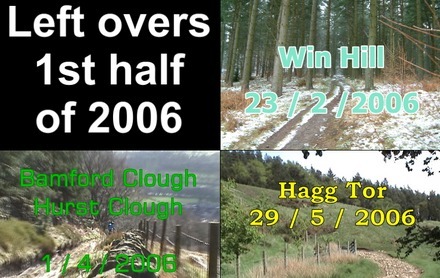 Oh yeah and James nailing Hurst Clough the fastest I’ve ever seen him to do it. Irwin rides Bamford Clough and Hurst Clough rather fast, with Nicky taking the stills on Bamford Clough and Jeff in strange positions trying to get the best angle for video. Bamford Clough is a steep, straight, track (which is technically still a road!) with concrete on its steepest section and loose and semi-embed rocks over the rest and an awkward concrete drainage gully at the bottom. Hurst Clough is also a ‘road’, with some tarmac and loose stones as well as some bedrock in a few places, but it slopes more gently with some smooth bermed corners. Oh yeah and Jeff spent ages doing a 3D map for this one. James, Nicky, Jolley and Jeff on a long ride, starting at Aston DH and heading along Hope Brink to HopeX DH, then up Hagg Tor with some sessioning and then along to Jolley’s and finally back down to Bamford. Jolley really gets himself good, ouch! Irwin and Jeff’s trip to Hopton, whilst staying nearby, the course was very wet after a lot of rain. We met two other guys also on holiday, Tom and Ben, and had a great day. Unfortunately some of the best footage was lost when the camcorder corrupted the DVD and we had only had room to backup part of it. Fancy some Left-overs? Three short vids in one from the 1st half of 2006. Our trip to Wharncliffe, Irwin, Pete, Bolsow, Halley & Jeff, with Pete showing off his no footers, impressive. This video is our guide to making a zip-line camera system, it was our second attempt using the MK1 zip-line camera system. The main problem with the system is timing, and it is only best suited to low speeds. dirt jumps and the beginnings of his Northshore. 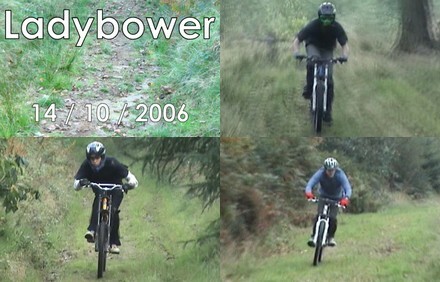 After the ritual fixing of Boslow’s bike we sessioned some stuff up by Derwent and then rode Gores DH. You can see how bucked Boslow’s back wheel was. This vid starts with Irwin & Pete messing around in Bamford, we then headed up to Nicky’s and were joined by Josh and Jolley before heading up to Stanage for a mess about. After Jeff’s big crash up at Nicky’s the weekend before he was on foot and ended up running a fair distance that day.